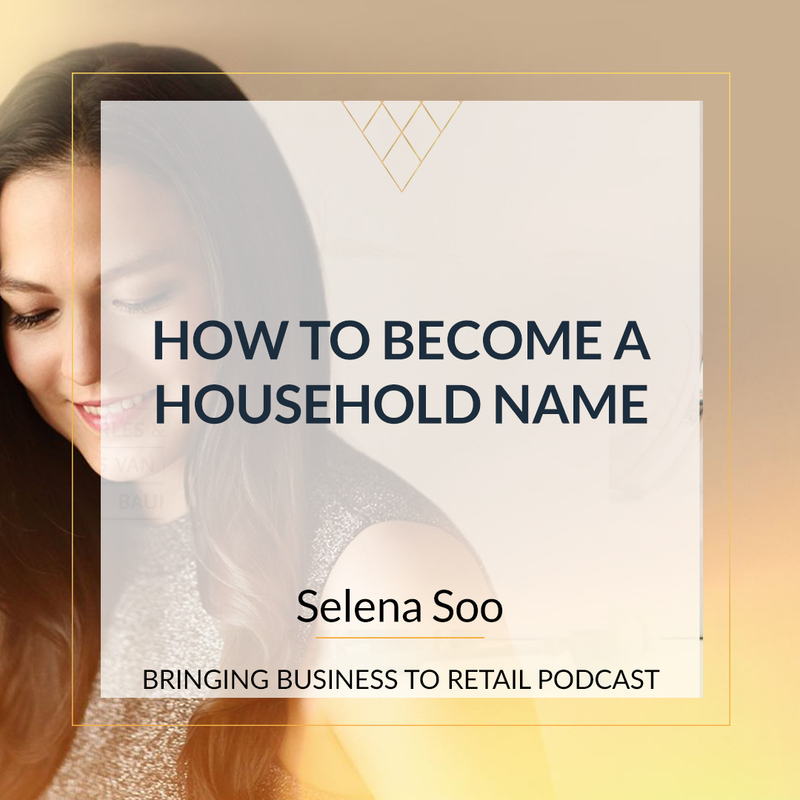 “The true entrepreneur is a doer not a dreamer"
Salena: Hey there and welcome to this week's episode of the bringing business to retail podcast. Now the New Year is upon us and everybody is going to be talking about gocity. Today, I've got a guest on the show who is going to talk to us about how to grow 50 percent without setting any goals. And you can see by this face if you are watching the video that I am a little bit skeptical because I am very much focused on give yourself a target if you want to call it a goal a goal give yourself a target so that you have something to aim towards and you can test and you can measure and you can make sure that you are on track. 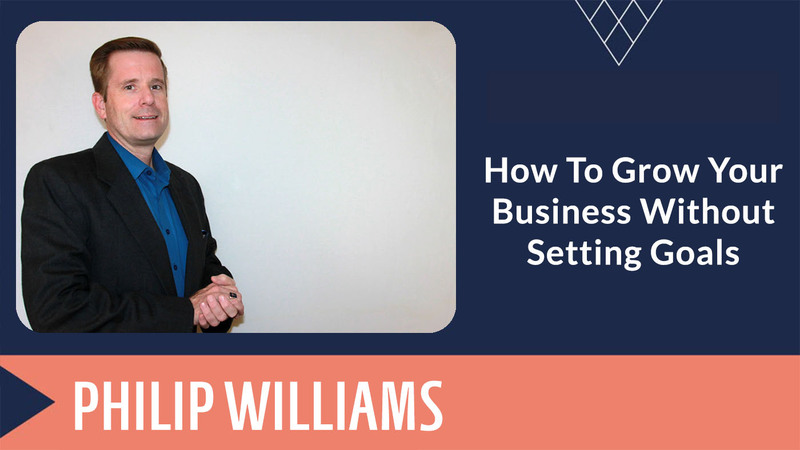 And today's guest Philip Williams, he's a three-time Inc 5000 honoree and he's been the CEO of a 17-year-old cash-strapped company and grew at 50 percent a year for five straight years. 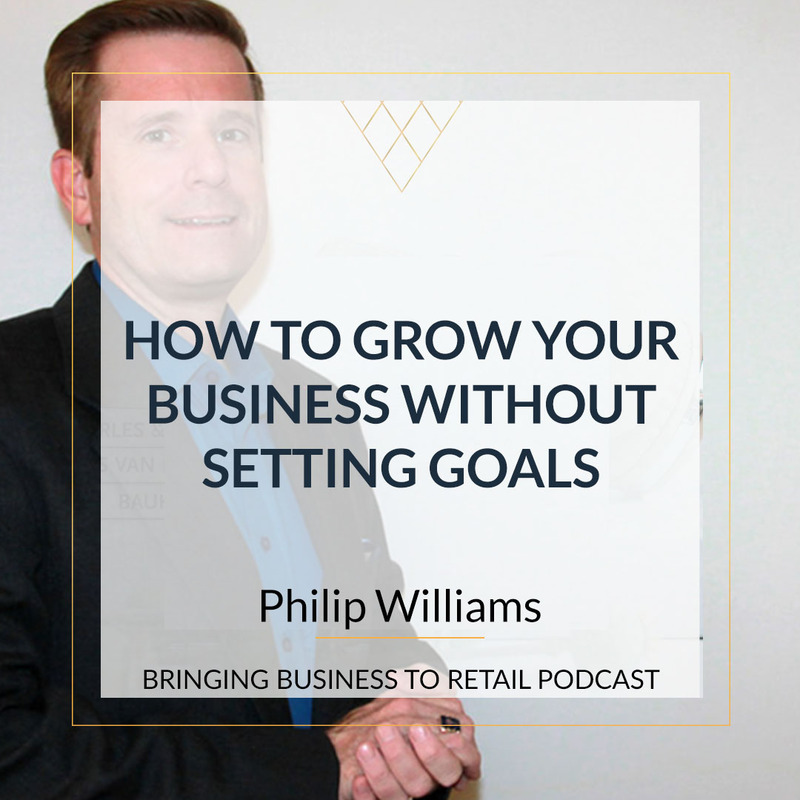 This guy knows what he's talking about so let's hear from Philip about how we can grow our business by 50 percent without setting any goals. Welcome to the show Philip. Philip: It's good to be here Salena. Thank you for that very gracious introduction. You make it sound so fun. Salena: Oh, well I'm highly skeptical so I'm mulling you into a false sense of security. Philip: Well it turns out there's actually quite a bit of real-world examples and research that's come out in the ten or twelve years since I did that. So I'm, while I'm sometimes viewed a little bit crazy and you're not the first person that's ever looked at me skeptically. Once you kind of see it and read through it, it does make a lot of sense. Salena: Okay. So tell us, before we get into that part. Tell us what gives you the experience, like we've kind of hinted here that you've done some business growth but what's given you; because you're real-life experience. This is not textbook stuff, you've actually done the stuff, you've walked the walk, you've talked the talk and then you write a book about it. Other than some people who wrote the book before they've even done it. So tell us a little bit about how you ended up here today talking to us about how we can grow our business immediately. Philip: Yeah, oddly enough I just published a book, at the front of the book there's about like 11 or 12 sort of foundational principles if you will that are mine through experience. I grew up in a small business family. I've been learning about business like my whole life. I remember vividly at the dinner table my parents talking about leases and passing on that price increase to clients and all of that stuff. So I've been doing this stuff for like I don't know ever. And so just over time I sort of developed some tenants or principles about leading people and you know how they like to be treated. And then also you know kind of blending that in with what we as business owners are trying to get done. And I, you know entrepreneurs and business owners where we're weird nuts to begin with. You know we just look at the world and that's why not everybody does it. But we look at the world so differently and I think we forget sometimes what it's like to actually be you know on the employee side of the fence. And if we could understand that and appreciate that it makes it a lot easier to get what we're trying to go. So a big piece of what I talk about is really understanding how your employees receive the message when you give them a goal. And so I went through and I; I went through this experience of building a company for cash a number of years. And I used to get this question, you know, how do you how do you know how to do this. And my answer, in the beginning, wasn't very good. And I realized one day that I need to sit down and explain this so that people can repeat it for their own benefit. Salena: We have we Moya, our big department store is Mya and it is doing exactly the same thing. Philip: Yeah, mistake after mistake. I mean in the United States in 1992, when Wal-Mart matched Sears on annual sales. Sears gave Wal-Mart their own head on a platter. They set a goal for their mechanics, they handed down their mechanics and said, you will have a $142 average invoice per customer. So what the mechanics do. They had no idea how to do that with integrity and based on the cars that they saw coming in and they started invoicing for hours that weren't done. They started selling customers parts that didn't need to be sold. And so they got that $142 and they violated their own integrity and in the process, they destroyed the Sears brand. When that hit the the papers here in the United States Sears automotive repair revenue dropped 15 percent overnight. Philip: That was the overnight impact right. They lost 50 million in court. And then, of course, the long-term damage that it does to your brand. So you know it's well and good to set goals for your team. But you've got to set them in a place where your team believes they can do it. I mean we all talk about get by it you know and you may hand a goal to a manager and they say well I'm having a hard time getting by it or what is buying. Well, you're trying to sell it where's your team coming from. Where are they starting it. Why is it that you're having a hard time getting by and if you put their shoes on for a moment and then ask yourself you know where are they coming from. What have they done that would allow them to believe and so often we as leaders forget. Yeah, we're out there because we're the ones that have these really really aggressive goals that we want to go achieve but you've got to remember the folks in the trenches in the front lines they have a bit of a different perspective. And so I always built; three and a half years before any employee in my company got an individual gold badge. All we did was focused on, so the first year it was all about do what you do. Do it very well focus on process and let's see what happens. We're not going to, yes we need to be profitable so we made sure that we understood things like you know our wage multiplier or whatever your key metric is. You know in retail it's what? Revenue per square foot right. And in engineering consulting, it's usual revenue per full-time employee. You know every industry sort of has like a one metric that you can get. You know if you're running a restaurant then you make sure the cost of food is you know 28 to 32 percent of revenue at least here in the States. So you're doing all these different things. You've got to know what you're one or two metrics are. But inside that metric you know you're in your first year, push to hold that metric and then ask your team what more can they do. And they'll find little tweaks hey I can do this I can do that. And you find out what they can do. And in our first year that turned out to be 50 percent growth. Now for some companies that might be 20 percent but hey on Wall Street the Wall Street love the 20 percent company. Philip: So he's paying for himself. Salena: Oh yeah. And everybody has a superpower. I like you said, they are so random those two things like we hire someone to shrink the pallets and he saved us money. But you're saying the same thing. Everybody has something that they can leverage in their own skill set that could increase the business if I got that right. Philip: Yeah. And the whole idea is just asking a person in the first year, hey, you know when things are going well for you, what are you doing? What's working for you? What do you have available? You know what's the order that you do the steps in. And I always look at procedures as ok, so we have to have written procedures right. We've got to have those because we need something to fall back to train. If somebody is out sick whatever you gotta have them. And then there is a person's style and you can have a person's style layered on top of a procedure. So I may have written the procedure ABC D E F G but that procedure may possibly be performed equally as well without violating it per say as a b c d e f g h you know maybe a step is out of order. Why? Well, I don't know. And at the end of the day is it ultimately super important. Yeah, certain steps have to be done and yes some things do have to be done in a specific order. But you know. So what is what is it that they're doing? What what's working well for them? Are they asking a client a certain set of questions ahead of time and that you know helps make sure that things go well. Or they may be processing things in a certain way or they just get better and more efficient. Right. I mean you can't, it's a lot like a human body. We go to the gym and you hear a lot of times exercise physiologists and gym coaches and those kinds of folks talking about how a client may plateau. A workout for six, eight, nine months and then they hit this plateau where it seems like they can't bench very much more or you know they can't squat very much more whatever. Philip: And then they may go through that plateau for three four five six months and then something shifts. They do something different maybe it's diet, maybe they change up the routine, whatever and they get more benefit. I think sometimes as leaders we forget that the mind is a muscle. And you cannot force a person to get better linearly 10 percent 15 percent 50 percent whatever the number is every year. And so sometimes you know they come in fits in the starts. You know there were months where we just had crazy months and then there were months where you know it was a 10 percent month. But on the average, the year would finish out very very well. Once we've done that once and you say to yourself OK guys what are the little tweaks that we can do to keep pushing this thing? Everybody will have ideas, especially if they're really really enjoying what they're doing. And you take those ideas and you say, well, you know look, guys, you guys manage to get this done at 50 percent last year. I'd love to see if we can do that again. Well, I'll be darned if they didn't do it again. So this is now twice in a row that we've done this. And then it becomes after you've done it twice now you can start pushing the identity concept. You guys grow 50 percent because that's who you are. That's what you do. Salena: Yep. And it is that own your own inbuilt competition within yourself. And I guess within your team because everybody wants that little bit of the push and the feeling of success when they achieve something. So you take 50 percent twice. Like you say, you almost got it on yourself that actually, that's the level that I perform at. That's kind of my baseline. Philip: Yeah that's what, I don't want to let me down. Yes. You know I'm not worried about a boss says ,you know I don't let me down. Salena: Yeah. And that is really important, that is the buy-in that we're talking about. Philip: Yeah. Then you then as the leader you're no longer getting by and you know what your job is. Your job is to get out of the way and make sure that team has the resources they need. And even if your team turn at 20 percent let me tell you something, 20 percent, four five six seven eight years in, 20 percent is a chunk of change every year. So you're no longer having buy-in conversations, now it's a race for you to figure out you know because every business does have limited resources. That's part of the puzzle right. It's got finite cash flow and sales. Now you're trying to figure out where do I put the resources so that this thing doesn't slow down? And how do I get the roadblocks out of my team's way? Your job becomes more about how do we get the roadblocks out of their way not about you know trying to push them because I know it's an expectation. Salena: By that same token it's also to inspire them because yes we can always do better. But you're gonna have those hiccups and the bad month where you didn't do 50 percent and maybe you went negative. So Keeping them inspired that this is their overall. Yeah. This is the end number that we're going to do. I still think this is a bit of a goal though. Philip: It's a very, none of my employees had individual goals. It was and we didn't say look you're not going to produce you know you need to have X dollars every week or X units every week you know or there was no artificial requirement like you're gonna have an average of it. It was all based on what can we do where can we push it. And the whole idea was you know we did have things like, hey if you wanted to buy a piece of equipment. Guess what, we had an ROI worksheet for anything that we spent money on. So we didn't spend money without going through a justification process. It wasn't some sort of a random sort of thing. There were sort of guardrails if you will on doing this. We had a charge out rate that was predicated on our cost structure and that kind of stuff. So there are guardrails but nobody had six KPI's ahead of it. We didn't even have a KPI meeting every month. I would just simply announce hey we hit the number. We're on a good track you know. And guess what. Yeah. The really cool thing is around about August you're standing up and going hey guys we're like this far away from hitting last year's revenue number at the end of August. And all we have to do is keep running at this pace for the last four months of the year. And we're good. We're 50 percent growth. And the other thing about that was after the second year when everybody starts thinking OK this is who we are this is what we do and they're setting that expectation. Then they know to start working on things ahead of time. One of the things that we do in corporate America that's not really cool and that unfortunately some of your listeners are either going to do to their team or they're going to experience as an employee, is they're going to come back from New Year's they're gonna have an e-mail in their inbox. And it's gonna say something like here's your 2019 gold package and it's January 4th. They're going to open up that gold package and they're going to realize they're two or three months behind. Because yeah, because leaders don't do a great job of telegraphing kind of the plan for next year. If you have a sales cycle. So if you have let's say a three or four month sales cycle then you might want to tell your sales team three or four months before the year is over. Kind of where they need to you know what kind of level you're looking for in the following year because they've got to start working the phones, going out and doing the visits and all of that sort of stuff ahead of time. Because those balls don't just instantly show up on the table. Salena: No. And I think in retail just to kind of tailor it cause people are probably listening going, how do I do that. 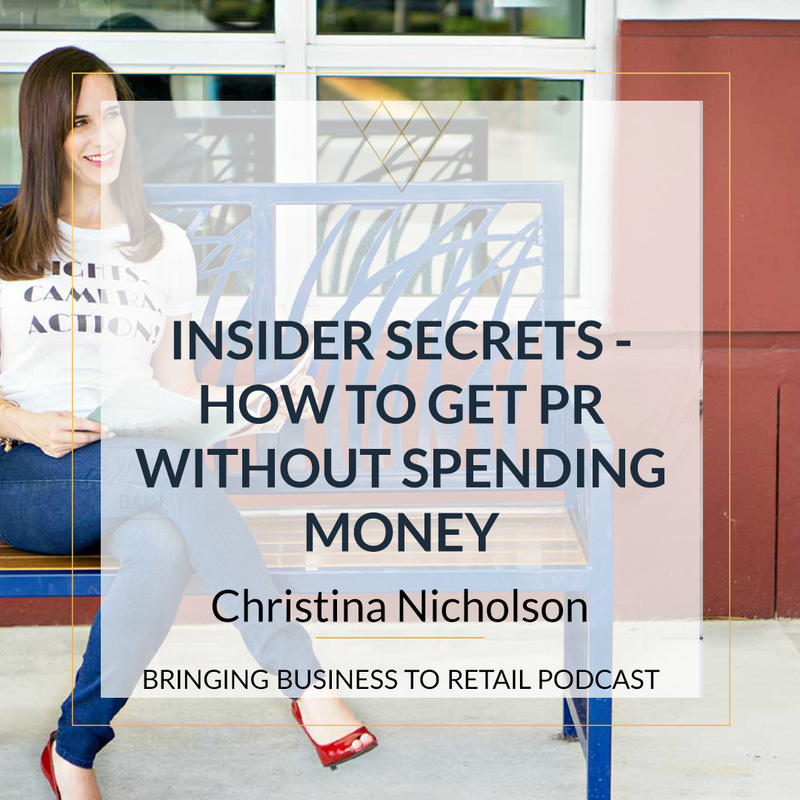 In retail, it's probably less about your team that is on the floor and more about if you're outsourcing your marketing or even if you're doing your own marketing. We're talking about you now. You're the person who's driving the traffic. So whoever's driving the traffic and I always say it's not the shop floors job to drive the traffic. That's your job or your marketing job. it's your job to sell the products once the people get there. So you're very right in the sense that maybe that gold package is actually their own because they've been so busy in mixed in the Christmas rush that you know they have a couple of days to decompress over Christmas and New Year, and then they feel like they have to jump back in. And, but they haven't done anything in December to get ready for January. They just kind of hoping. Philip: And that's something that I talked about in the book was, hey, if you're not spending the money on marketing to drive the traffic ahead of time your teams got to know. Philip: So if you show up with this goal on January 1st where all of a sudden look we're going to shop 20 percent this year and it starts in January and your team is thinking well how am I going to grow 20 percent in January. Hey it's January. Salena: Yeah, and here in Australia in January that's also a holiday. So everybody; unless you are in a high tourist area. January is usually a pretty, especially the end of January is usually quite a quiet month once you got past the post Christmas sales, that January, February is the quiet time for most retailers. And like you said if you took the break off because all you did was advertise Christmas, then your staff are sitting there twiddling their thumbs in January and you're getting annoyed because they're not making the sales but actually it was somebody else's job to get people in the store. Philip: Yeah and they're sitting there going, wait a minute, what's the problem you didn't do the marketing. Salena: Yeah. Yeah. And then you are building up that resentment aren't you. Philip: Right. And so it's that frustration. Well in particular in your example in the retail example, you may have seasonality in your curve. We did in our business, our business was incredibly seasonal. Philip: You know in November December January and sometimes well into February those were the coldest months here at Jeff is X company. We worked outside a lot of times in the snow. You can't do electrical geophysics in snow because electricity and snow which turns into water or electricity on it is like not fun. Salena: Not conducive to a healthy lifestyle. Philip: So we, Yeah we have a very seasonal business. And so we had to allow for that. So it was like we just want our January to be 50 percent larger than last January, rather than we're going to have this sort of even revenue. But if you're not doing the things ahead of time that your team needs you to do they're going to know. And you know whether it's buying equipment, making the capital investments. If you're not talking with your banker ahead of time to arrange financing. Our team knew every year when I was going out and talking to the banker about next year's credit line. Because if I was going to have a certain amount of revenue every month I knew I needed have a certain size credit. So they know if those conversations are happening that is one of them. Salena: I think that is one of the ways that independent businesses can come undone is they don't realize that some give me some businesses don't operate on cash flow the whole time of the year. Like they have more cash flow in December but come March they might be drawing on the line of credit. But they've forecasted that. So they understand you know over the period of time this is where the money comes in and goes out. And I think that, we don't get taught that stuff in school right. We talk about money. We don't get told that in university. I've got a business degree. We didn't; no one talked about that stuff they might have talked about cyclical sales and forecasting but no one ever said actually in the real world if you run a business sometimes you might be operating on an overdraft. But in order to be profitable this is what you need to do. Salena: So my next question is for you, is people who are taking these on board and going OK I need to identify what those; how am I going to get my team on board. How am I going to set some numbers or some I.D. or have an understanding of what my business looks like. But actually I'm so busy on the shop floor in December like it's all hands on deck. And then even January comes I just want to take that time to breathe. How do you, like what advice do you give to them to not feel so overwhelmed and actually go into the new year with a pep in their step and a plan and the resources to actually make more money? Because you've done this over and over again. Philip: Yeah. Well, we're a little bit late in the game since we're starting in January but a couple of things. Salena: Let's give people, let's pep them up anyway. Philip: Well you ever read out Outliers by Malcolm Gladwell. Philip: Okay. Awesome Book that totally crushes the idea of having a set calendar year for things. And that's one of the things I love about that book because as an example he talks about; the book actually starts with him at the junior national hockey game or something like that. It's kind of like minor league hockey in Canada and his wife points out. She says, hey, do you noticed anything about these players and he says No I didn't see anything special. And you read their names and there's nothing, in particular, that's what's common about him. And then if you substitute their birth dates for their names, you start realizing that every guy on the team, well, I think 80 percent of them were born in the first quarter. Why is that? Because the hockey age cutoff in Canada at age five is December 31st. So kids that are born in January wind up having more skill because they have 11 years of maturity. Yeah. A year later you know they're competing against a kid who is you know now when they're five they're fully five years old. They're competing kids four years and one month. That's phenomenal. That's 20 percent of your life. That's a big difference when you're learning a skill at a very early age. And later in the book he points out you know if we had three age group cut-offs in sports, you know January April August we would actually have three different leagues and we would notice that skill levels by the time they were adults were all identical. So let's do this I don't care that January 1st is right around the corner or that it just happened depending on when you're listening to this. Stop worrying for the moment about January 1st. Philip: But the second filter that they put that through is their own self-belief and employees self-belief is what governs the goal that they set for themselves. So that's really what you've got to understand is what does your team believe they can do. So if you're listening to this show and you're thinking yourself OK I'm willing to back off just for 12 months to find out what's going on. If you go to your team one on one you say look, throw out this goal that I've set of 90 percent growth this year. What do you think we can do? You know based on what you know about the business from the chair that you sit in, wherever it is. I don't care if it's we're talking retail floor sales. If we're talking about a warehouse manager, if we're talking about your buyer who is out there trying to find a good product to put in your store. I don't care, what is it they think that they can do in their role? And they may give you a number of 5, 10 percent improvements. OK if I can give you a couple of tools, not anything like wild and crazy, but if I can give you a few tools in the next few months. Which tools would you like to have and what could you do with them? Going back to that ROI that we were talking about earlier. Salena: And I think really great just to jumping in here, really great team members would say 5 or 10 percent but if we had such and such I reckon we could double it. Like maybe awesome team member already knows what it will take. Philip: My experience is if you've got people who are engaged they've got ideas. They've got ideas and they've got a bunch of them and they're just dying for you listen to them. And if you go around and you say, if you were to have that conversation with your team and have it being an open conversation. Because I think a lot of times you know if you have that with somebody and you haven't qualified the conversation. What you're going to wind up with is they get a little disgusted because they told you the three things that they wanted and you didn't come back with any of them. So you have to have a qualified conversation with them. I mean you say, look, I'm going to talk to everybody and I'm trying to figure out where to best spend our money this year. And I'd like to get something for everybody but we've got some competing priorities. I want to hear from you. What do you think? I'm not going to promise you that I'm going to spend the money on it but I might come back and be able to spend the money on it. Maybe it doesn't need any money, maybe it just needs the process to be tweaked. Salena: All right. Different resources that you've really got allocated. Philip: Yeah just shifting things around. In a lot of cases that's really, really true. So, go have those conversations with everybody and then sit down and say OK, bang for my buck. Where am I going to get the most benefit? And then you pick the three or four or whatever it is that you can afford. And you go back and you meet with everybody you said this is what I decided. Here's all the great feedback I got. This is where we're gonna go. And you know what, you may have somebody who's number six on the list as far as priorities. But it might be that some of those initial opportunities pay off well and you can come back to number six and invest in them second. And if you do that, you'd be shocked and amazed and it's just, it's all about finding out what they can do. You know when a horse trainer takes a stallion out for the first time, all they want to know is, what can this horse do? So my question to you is what can your horse do? Salena: Yep. And I think that I'm so passionate about the whole superpower thing because I've always had fantastic. I think I hire really well and I've always had fantastic staff. And they would come up and they'd say, oh I just read about this thing. It's sum out, that's 15 dollars amount, that if we did it, it would take like an hour a week off about you know what I'm focusing on right now. And I think those people you know like you said, they out there and they're looking at what could improve the business because they genuinely want the business to grow. And it's not even about you know I'll get a pay rise. I truly believe in this company and what we do. And I have you know the self-satisfaction when I come to work and both things like you said filter down. So the person who is down the bottom, maybe, you're putting it out on the table. Maybe that number 6 person actually has a resource that you could utilize or has a skill set you could utilize. And all of a sudden their own sense of self and sense of buying in the company grows. Because you've acknowledged that I'm really good at something that, maybe I'm good at taking photos and I do that as a hobby. But I could do flat lies for the shelf. Like it never occurred to me to ask for it because I just am a casual person who only comes in once a month or whatever. But then maybe the resources are sitting in that pool of talent that you've already got it. Philip: So here's a really cool quote that Steve Jobs isn't super well known for, but I absolutely love and it goes like this, once you get a core group of about 10 people together, who are really passionate about something. That group becomes self-policing. If you can unlock your team's passion in different ways by engaging them in this way and just saying, look I don't know what this year's gonna be. But and it's a little bit crazy but you're going to feel a little bit like you're sort of turning it over to them. Not really because you've got your ROI rules and you've got your wage multiplier rules and you're, you know sales per square foot. You've got those sorts of rules and you've kind of, you've got to let the team know, look there are some navigational beacons that we've got to stay between. But I just want to say, once you engage them like that, and they realize that they have control, because that is an element of goal setting. There will come a point, I'll tell you this right now. There will come a point in your business where you do actually need to set goals and give out goal packages. But by the time you do this once you've done it probably three years in a row, you're gonna know what those numbers should be, what the goals should be, what the categories should be. And from there, then you can move forward. But if you just kind of opened it up and go for it. Now you have a few other things like maybe strategy or where you need to focus and that sort of thing. And you might have to say to somebody, hey, that's a super great idea but unfortunately maybe that's a dying market. And I don't want to go out for something that's shrinking. So I really prefer to use your other idea over here that you thought wasn't too great because I think it fits this piece of the strategy over there. And they get it. That's sort of the feedback. And one of my tenets at the beginning of the book is that nobody comes to work to do a bad job. Managers fill those people. Salena: I agree I am on board with you. I think if you attract the right people in the beginning, and you treat them well and you give them what they need to feel fantastic when they come to work each day, they will be loyal forever. And it will be those people who actually take you onto greatness. Philip: And let me tell you something about the time when you've hired the 20th person in your company, if you are using this approach, you're not going to be worried about that first conversation in the lunchroom when you are not around. It's not a problem because they are going to roll into the lunchroom and they're going to start to really sort of asked questions. Day 2, 3, start to say, hey, what's it like her or I've noticed this I've noticed that. And you start to hear about hey, leadership does this. They ask for feedback every year. We may not get everything, but we get a lot of stuff. A lot of things that we need, the tools, they are not afraid of us trying ideas which are, you know, my first job that I worked at outside of when I left the military, there were a lot of people who didn't like it there. I loved it there because I found out that they would let me try crazy stuff. And they actually did have; they did give me a gold package once I started; when I actually installed a goal package. But one of the things I did and that I learned there was a big chunk of my goal package I had control over. I had a lot of control. And that came from them learning, hey if you turn people loose and let them go in a direction that they want to go in, you will love what you got. And so that's kind of I guess the lesson of this is how do you figure out what they can do? And are you willing to let go of it long enough to find out? 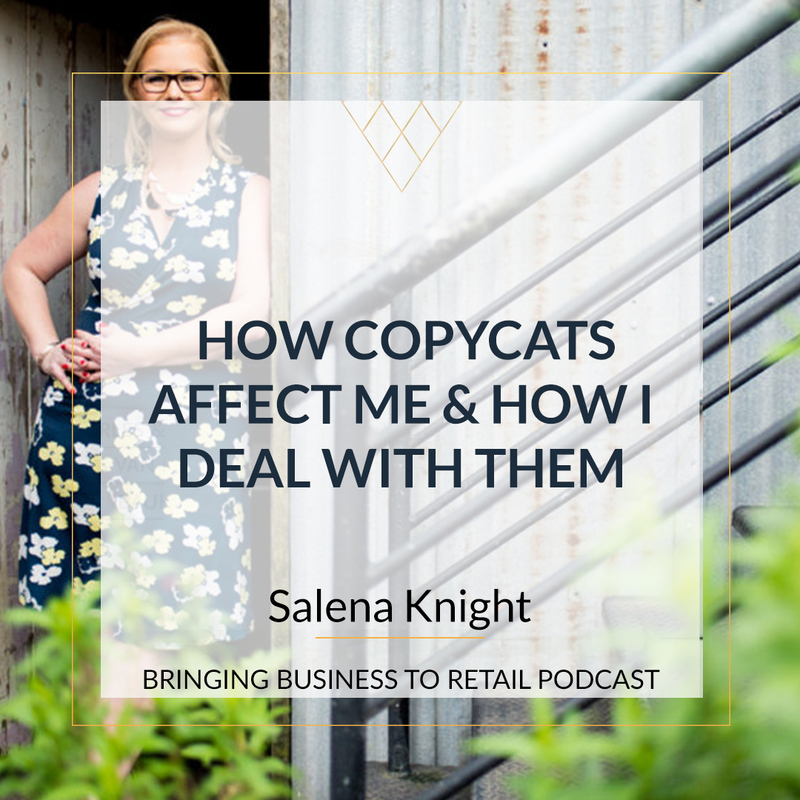 Salena: And can you then embrace that to help your business grow? Philip: Yeah and it's not the easiest thing in the world. Because let's face it, some of us are really a bit like control freaks. Salena: This is very true. I think you have given us a lot to spew over So I'm going to finish up there but, you have some resources that people are listening if when they are listening and they are like, I think I need to dig into this a little deeper. You've got some resources that I think you are going to share with us, haven't you? Philip: There are a ton of resources. First actually on my website, there is a page called resources and they are all free. There are lots and lots of different stuff in there. There is a six part mini-course on simplifying your business because that becomes very difficult when you are growing at this pace. A newly published book that's out. My website is askphilipwilliams.com. And then on Amazon I actually published a book just a few weeks a go on this exact goal setting approach. And it's called momentum goal setting. And if you go there you can download it and take a look and see. Salena: Fabulous. Well, thank you so much for sharing. I think it's definitely a different perspective for a lot of people going into the new year who are sitting here going, you know, I think retail is offering a run on financial goals. This is my revenue and I want 30% growth this year. How are we going to get it. And they kind of forget that, you know maybe the entity that is already sitting in front of them. The team, even if it is the casual person that comes in once or twice a month. Philip: You got a team of people that are all walking around and thinking something. I promise you none of you has hired 100% people who are brain dead. Everybody there has something going on, some idea. And I just want to encourage you to tap into that motivation and let them run with some of this stuff. You know if you guys think back to way back when Google began. I don't know if anybody remembers the story but I know that a lot of people thought that it was a little bit crazy. When Google first started, they let their employees spend one day a week on a project that the employer picked. It didn't even have to be company related. Look at the growth that, that company went through. Just by releasing their employees to work on something that they loved for 20% of the time. Philip: Well, letting them go is a wonderful thing. It's just like letting your children learn to ride their bicycle. Salena: Alright, so if you would love to learn more about how you can embrace all of this and take some of Philip's knowledge and increase your business. Head over to askphilipwilliams.com and you can download those for free. Thanks so much for being on the show Philip. business. He’s worked in manufacturing, distribution, engineering consulting, and professional services. company and grow it at 50% a year for 5 straight years. bootstrapping the business - no outside money. respected companies through his consulting firm.